All transactions are safe and secure with a reliable history in online purchasing behind each of our associates. Buy the Sweep the Leg Cobra Kai t-shirt to own Karate Kid clothing and merchandise. "Sweep the leg," instructs sensei John Kreese, as he coaches his Cobra Kai protégée, Johnny Lawrence, at the All Valley Karate Championship. This memorable moment occurs during the tournament fight between Johnny and Daniel, when Daniel's leg is hurt. The ruthless Cobra Kai instructor tells Johnny to show Daniel "no mercy". This Karate Kid Cobra Kai t-shirt is available in short sleeves. 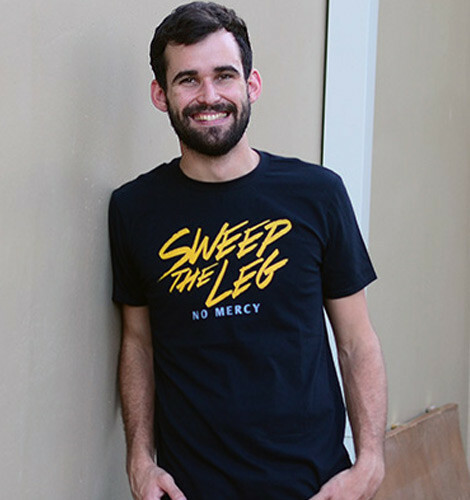 In addition to the Sweep the Leg Cobra Kai tee above, browse the Karate Kid Clothing Gallery for more apparel like men's and women's clothes, kids shirts or hoodies.